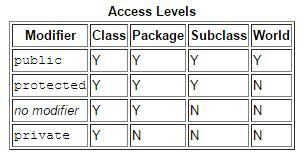 Can be accessed within the class as well as inherited class from different package. Can be accessed only within the same package. Can be access only within the same class. Refer below diagram for details. whereas member variable, methods, constructor can use all the four access modifiers.